In 2018, the MLB regular season ended on Sunday, September 29th. A one-game playoff now decides the wild card spot for the National League and American League which will air on October 2 on ESPN and October 3 on TBS, respectively. The best-of-five game Division series begins the day after, on October 4, with television coverage shared among TBS, FS1, and MLBN. The best-of-seven playoff series begins October 12 airing on TBS and Fox. This year, as usual, the final battle of the World Series airs exclusively on Fox. It gets underway on Tuesday, October 23, 2018 and may well last until the 7th game scheduled on October 31. As the Boys of October take to the field, check out the full TV schedule, along with world series trivia and related resources just up ahead. 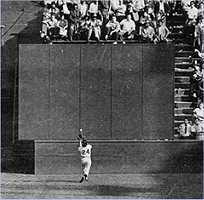 "The Greatest Catch Ever Made,"
Willie Mays, 1954 World Series. • The New York Yankees hold the record for the most World Series wins, with a total of 27 championship titles. • "The Greatest Catch Ever Made" was during the 1954 World Series when Giant's center fielder Willie Mays made his fabled running leap for a 460-foot shot from Indians' slugger Vic Wertz. • Yankee Don Larsen pitched the only perfect game in World Series history. The no-hitter occurred in Game 5 of the 1956 World Series. • The most storied underdogs in baseball, the Amazin' Mets climbed out of the basement to beat the heavily favored Baltimore Orioles for the championship title in 1969. In total, the Mets have reached the World Series four times in franchise history (1969, 1973, 1986 and 2000). • San Francisco was rockin' in 1989 when a devastating earthquake hit the Bay Area during Game 3. The game was postponed for 10 days before Oakland went on to sweep the series. FOX Sports - Major League Baseball - The official TV broadcast station of the major league World Series games with stats, schedules, scores & results along with the latest headline news & rumors including video highlights, photos, fantasy baseball. Major League Baseball - Get right to the meat and potatoes of who's in competition for the pennant championship with this site's chart showing the current standings of each team in the majors -- updated daily during the season. Baseball Prospectus - Opinions on which teams are cracking the stats it takes to win the playoffs and get to the championship games. Analysis of players, positions and historical comparisons make for interesting and informative reading. This site has a section for fantasy managers who want to keep up with their players info and tradeability. World Series History - From famous ejections - to the MVPs from seasons past - check out major league history, trivia and World Series fun facts at Baseball Almanac.com.